Here’s a guest comic by Justin Boyd, one half of the fantastic webcomic Left Handed-Toons, where all the comics are drawn with the wrong hand. The EVIL hand, some say. Actually I think it might be the humour hand, because Left-Handed Toons is always very very funny. I’m feeling kind’a jealous ’cause this is beautiful and I can’t do any guest comics ’cause I don’t have skills for being funny. Anyway, as I said before this is beautiful… I love the colors. This is why I only shower at night. did he draw this with his left hand???? It’s perfect for who ever that was. Oh I love the background color! 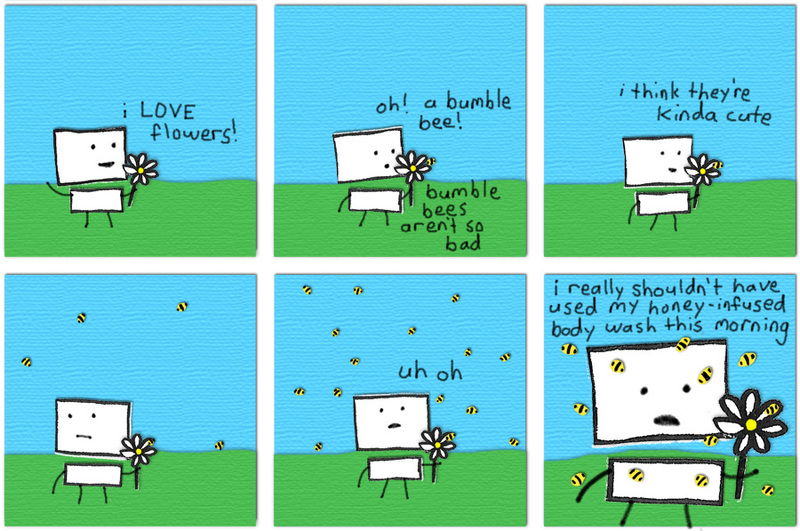 And the bumbles are so cute! Why isn’t Colin brown? And-and why is there 2 colors in the background?